Four intrepid athletes attempt the first ever row from mainland Africa to North America, recording it for classroom lessons in schools across the United States and Canada. >> the ocean almost never gives back what it claims, but then there are these images. it's amazing that this video exists at all, having once been lost to the capricious will of the sea. and yet here it is to tell frame by frame its harrowing story of the four young men who imagined they could best the wind and the waves and the unpredictable elements across the atlantic , all the way in a rowboat. there was jordan , the captain, adam , the olympic gold -medal winner, marcus can adventurer, and patrick the rookie ocean rower , and this video can only tell their story because it was retrieved after what happened to them in the very ocean waters they had the audaciwudacity to explore. >> 7:30 saturday morning, nobody calls. and i saw that i had 11 missed phone calls . and i knew. 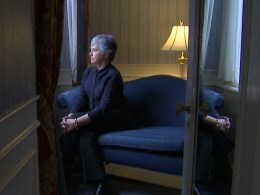 >> reporter: at home, a mother sat and worried for weeks before she got the dreaded phone call . >> and the world stopped. every fear i had had come to fruition. my son was gone. he was swallowed up by that ocean . >> reporter: her agony shared by three other families. >> everything in me says this isn't okay. what's happening. we can't tell how many people are in the raft. >> reporter: none of them knew who lived or died. what's that feeling like? those are friends of yours. >> if there are only three beacons going off, why isn't there a snourt who dfourth? who did i lose? 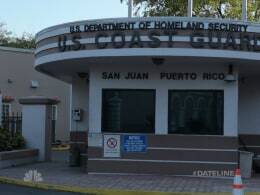 >> reporter: the story begins in the winter of 2013 when four young men from the u.s. and canada set out to become the first people ever to row across the atlantic from africa to north america , dakar, senegal, to miami, more than 3,500 miles. this footage was shot while the crew was getting ready to leave africa. >> everybody just is choosing to do this and so the only authority that i'm really granted is my experience from rowing across the ocean the first time. 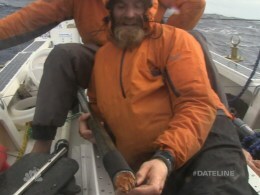 >> reporter: 30-year-old jordan hanson, the expe edition leader, had already row ld across the north atlantic . his craft was named for his father, who died of asthma when jordan was 3, the james robert hanson . >> we'll be fighting to stay noort little bit the whole time. >> reporter: the trip had taken jordan three years to plan. sponsored by the canadian wildlife federation , the crew would provide lessons for hundreds of schools in the united states and canada and investigate the effects of climate change on the ocean . >> we have some pretty large goals associated with our row across the ocean , scientific education , communication goals. >> reporter: 32-year-old adam creek won the olympic gold medal in rowing in the 2008 games in beijing. he was the father of a 2-year-old boy, jefferson, and his wife rebecca was pregnant with their second child by the time the expedition was about to set off. >> reporter: but people would say in spite of that it's still a crazy thing to do. >> reporter: and responsible for a young father. >> for me the difference was he wasn't doing this because he thought, you know, it's going to be so fun, i'm going to row across an ocean just for conducts. this was partnering with the canadian wildlife federation , raising awareness, educating youth. >> ocean ph levels are changing. >> reporter: marcus was a surfer and paddle boarder. he'd already rowed around canada's vancouver island . he was 29, single, both parents dead, but his sister, brother-in-law, and two nieces were following him very closely. along with the others, marcus helped plot the course. >> reporter: and then there was 29-year-old patrick fleming , an expert skier and college rower. they called him the rookie because he never rowed in the ocean before. but his thrill seeking was matched by a compulsion to be prepared for the worst. >> even on the ocean , you know, there's part of me many day where is there's not going to be this riveting, edge-of-your seat excitement, but yeah, we're still row, we're still moving, then there's going to be a moment of sheer terror that will pump us up for the next two weeks. >> reporter: patrick's parents hated the whole idea. his mother, diana. >> ron said to me very calmly, he's an adult, i can't tell him what to do, but don't worry, he'll never go through with this. put it on the back burner. take it out of your head. famous last words . 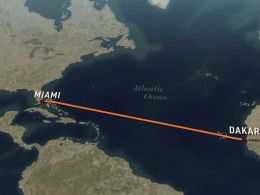 >> reporter: on january 23rd , 2013 , the james robert hanson and its crew pushed off on their journey to miami. with good weather they thought the trip would take about two months. >> the last thing i said to him when i saw him was, "come home to me." >> reporter: the crew members planned to work in shifts. two would row while the others slept below deck. >> i was um sending an e-mail off to the parenting saying they're off, call me anytime, the expedition has begun. let's go. >> reporter: his friend greg spooner became a one-man mission control back in washington state , keeping track of them best he could from his base on land. >> and right out of the gate, though, you could see something was just a bit off in terms of their progress. >> reporter: the crew suz supposed to be able to contact greg by phone or e-mail. they also had three cameras on board to record video diaries . but they were plagued by power problems, and so the satellite phone and internet service was very dicey. greg didn't hear from them for several days. but according to their gps tracking device, they were moving far too slowly. >> well, looking at the wind, it's coming out of the north. they're going west and so they're just getting hit from the beam. and it's probably terrible. and sure enough, i got the fist phone call from jordan a couple days after they left, and he sounded miserable. 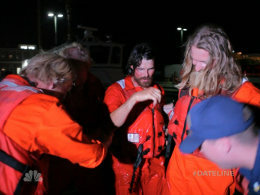 >> reporter: that's because all four crew members were seasick in the extreme. but adam , the olympic gold medalist sitting behind jordan , didn't let it get him down. >> seasickness. it's like a slimy lizard climbing from the bulging pit of your stomach up the back of your throat. it feels fantastic. >> reporter: you never had any serious worries that catastrophe would befall them. >> i did initially. 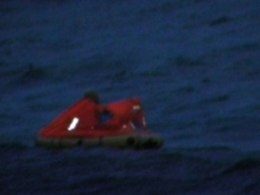 this is a dinghy in the middle of the atlantic . it could grip flip. and the interesting thing is i was always told by all the guys that was a very unfounded concern. >> reporter: that's what the rowers thought. but the ocean never makes guarantees.